Persephone is a Maiden Goddess. She is the daughter of Demeter, the Grain Goddess. The Maiden represents spring, nature, and purity. She is both the first and the third of the three aspects of the Goddess: Maiden, Mother and Crone. Demeter, the second aspect, represents the harvest. The story of Demeter and Persephone is an origin story which explains death and rebirth, the changing of the seasons, and Persephone’s transformation from Maiden to Crone. There are two versions of the tale of Persephone. In one version, Persephone (also known as Kore) went willingly into the Underworld to care for the dead. She anointed each spirit with pomegranate juice to aid them in their rebirth. In the later Homeric hymns, Hades, god of the Underworld, raped her as she went to the Underworld. While Persephone was in the Underworld, Demeter grieved for her daughter. In her absence, nothing grew. The earth turned cold and the grains withered in the fields. 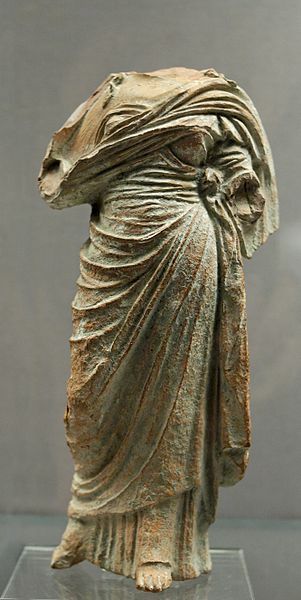 Demeter disguised herself and traveled to Eleusis. Celeos, the daughter of the King, let her live there to care for the child Demophoon. Demeter tried to make the child immortal by passing him through fire, but Demophoon’s mother Metaneira caught her. Demeter taught Metaneira the mysteries and a temple was erected in the Goddess’ honor. All that time, the Earth remained cold and infertile. Zeus sent Hermes to implore Demeter to cause the earth to grow again. Demeter refused until she was reunited with her daughter. Hades had tricked Persephone into eating a pomegranate, though. She is thus forced to spend six months with him in the Underworld and six months with her Mother. Persephone’s return signals the arrival of spring. Demeter waves her hands and the earth turns green and lush. Persephone is initially in the Maiden aspect of the Goddess and upon her eventual return to the living, she shifts to the Crone aspect — the Death Goddess of rebirth. Persephone is known as Queen of the Dead. She maintains her vigil over the dead in the Underworld, which makes her the Crone. One of her emblems is the pomegranate: the fruit, the juice, and the seed. The pomegranate is the food of the dead. Pomegranates are symbolic of the life and rebirth cycle. Pomegranates are central to the Eleusinian mysteries of Demeter, Hades and Persephone. It can be seen on the High Priestess tarot card in the Rider Waite Tarot deck. They are symbolic of the cycles of life. The rich red color of this famous fruit also symbolizes blood. The seeds suggest fertility. The pomegranate’s structure symbolizes the dead lying in wait to be reborn and achieving Oneness with the Dark Mother Goddess. The pomegranate’s ruling planet is Saturn. Its gender is masculine, its element is Fire, and its deities are Persephone and Ceres. Its powers are divination, luck, fertility, funerary rites, and spells. Its magickal uses are divination, and wishes. It unites life and death. The outer shell is hard and inside the seeds are fleshy and ripe. The pomegranate has healing qualities. Persephone, known as Proserpina to the Romans, holds the keys to the Underworld. Persephone is the Great Goddess of the Eleusinian mysteries. Her Element is Earth. Her sphere of influence is fertility and renewal. Her colors are silver, black and brown. Monday is the best day to work with Her. Her symbolic planets are Pluto and the Moon. Here is a Maiden Meditation to aid you in a journey to the Underworld to cleanse you. Sit comfortably whether you sit at your altar or in a chair with both feet flat on the floor. Close your eyes and visualize a white light showering over you. Visualize it until you are immersed in the light. Take three deep breaths to cleanse your mind, body and spirit. Relax your entire body. See yourself standing next to an old well. The well is covered with moss. The stone walls of the well are worn by time. Reflect on your troubles and drop your troubles into the well. The water neutralizes the negative energy. Now you are cleansed and renewed. A path leads to a clearing in the trees. After a while, you arrive at a high cliff wall at the end of the path. You see an iron bound oak door. The narrow door has a brass ring on one edge of the door. Pull on the ring and the door opens. You enter and see a long tunnel winding into the darkness. Some torches illuminate the curved roof. You take one of the torches and make your way through the tunnel. The oak door closes behind you. The torch lights your way down the dark tunnel. As you struggle down the tunnel, you think about the Maiden. The tunnel begins to curve, and you see smaller tunnels, but you feel no interest in exploring them. As you come closer to the entrance of the main room, you hear dogs barking. You know that dogs, especially black dogs, are guardians of the gates of death. You know you have nothing to fear. A light shines ahead and you hear voices. You continue on, and hold your torch high. The sound of barking grows louder. Around a corner of the labyrinth are a group of men and women, holding torches. A strong woman leads them. You know she is Persephone, Queen of the Dead. Her curly dark hair is tied back. She carries a bow and quiver of arrows and she wears hunting boots. An owl sits on her shoulder watching you. Her hounds bark at you and sniff your hands. Persephone stops before you and regards you with a piercing gaze. You look into her knowing eyes. She beckons to you and you follow her along with her companions. She leads you deeper into the labyrinth. At the head of the temple, across the room, you leave an offering and bow. Persephone asks if you are truly ready for the cleansing and initiation. You breathe deeply and answer that you are. Step into the deep large cauldron and immerse yourself in the healing water. Leave the cauldron and put on your clothing. Feel renewed and energized. Persephone leads you out of the tunnel. The sound of dogs barking fades. The torch leads you to the ironbound oak door. The journey to the door is shorter than the journey into the tunnel. You feel content and at peace with yourself. Take three deep breaths and return your awareness to your surroundings. Reflect on your experience. Record your meditation experience in a journal or your Book of Shadows. Pay attention to auspicious signs and apply what you learned from the meditation to your life. Persephone is a strong Goddess. She endured much and yet retains her strong sense of self. She transformed from Maiden to Crone. She is in balance with the light, living with her mother, and the dark, as Queen of the Underworld. She bewitches and inspires. Conway, D.J. Maiden, Mother and Crone. The Three Faces of the Goddess. Woodbury, MN. Llewellyn Worldwide, 1994, pp. 27-31, 135-136. Huggens. Kim. Memento Mori. London, England, 2012.